As much as I might ooh and aah over some beautifully decorated and artfully frosted cakes, the fact is that I usually prefer something more simple. 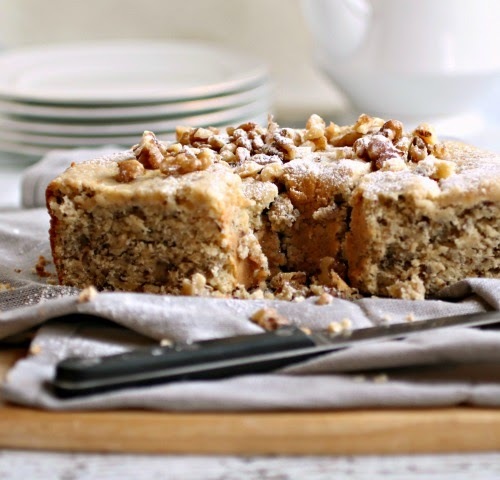 Give me a crumb cake and make sure there's a thick layer of it, a good coffee cake dusted with powdered sugar or a simple almond pastry and please have a pot of tea ready as well. My personal taste in pastry might not require cake decorating classes (actually I think those would be fun) but it comes with its own challenges. Simple means there's less room to hide and each ingredient needs to shine. Without frosting, that coffee cake had better be moist and the butter and vanilla good quality. Simple has to be right but, when it is, it's so good. And it's my comfort food. Enjoy! Add the sugar and butter to a large bowl and cream together using a stand or hand mixer. Beat in the eggs and vanilla followed by the sour cream and milk. In a separate bowl, sift together the flour, baking powder, baking soda and salt. Mix the dry ingredients into the wet and then fold in the chopped walnuts. Pour the batter into the prepared pan and bake for approximately 50 minutes or until a toothpick comes out clean. Cool completely before removing from the pan and dust with powdered sugar. I love looking at fancy cakes, making fancy cakes, but not eating fancy cakes. 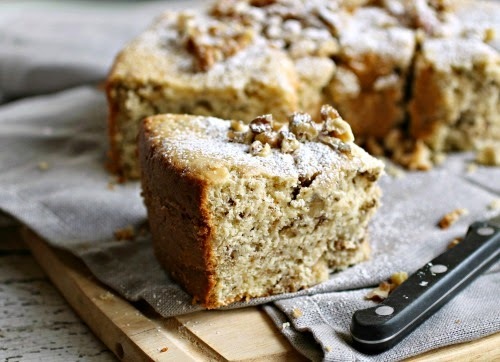 I'd rather have a big slice of something fruity and nutty and oh so perfect in every tiny detail rather than a slice of fancy cake. 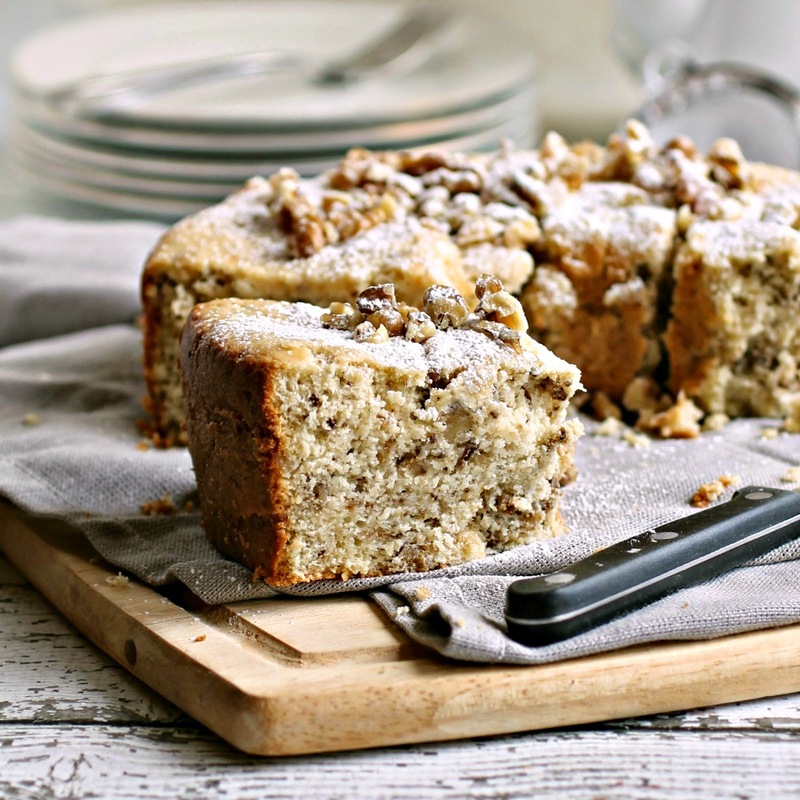 This walnut cake is my version of absolute comfort food too! gorgeeeousness! I love simplicity--I'm def. no decorator lol. 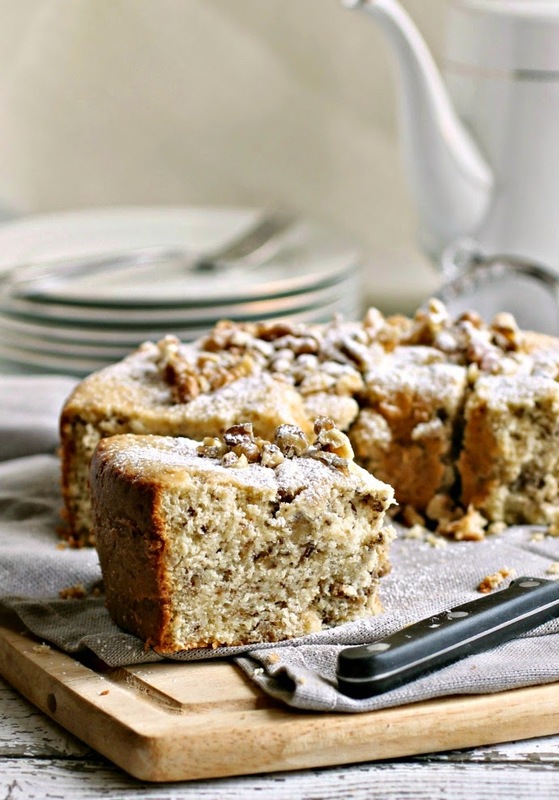 You're always the queen of crumb cakes and this is just another win!